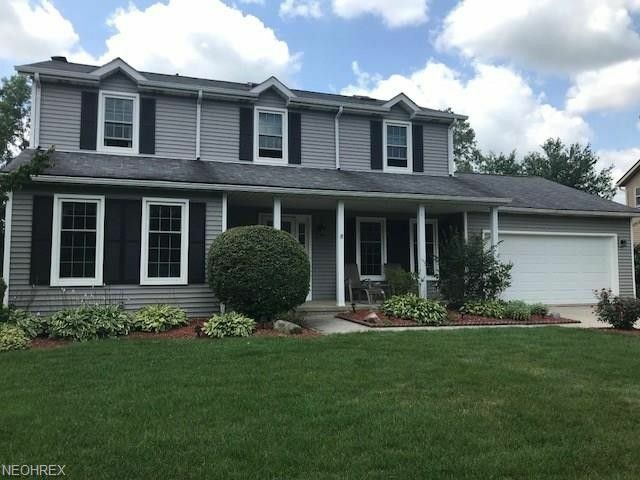 Location Is A Huge Plus In This Large 4 Bedroom Medina Colonial! Fred Greewood Park IS Your Backyard Bonus! Original Owners!! Ohio Magazine Has Named Medina A Top City To Live In This Spacious Home Has A Picturesque Kitchen With All Day Views Of The Vast Park! Sprawling Eat-In Area With Bay Window Flowing Into Family Room With A Real Wood Burning Fireplace! All The Action Is Right Here! Formal Living Room And Dining Rooms Are Anchoring Each Corner. First Floor Laundry Is Convenient And Mud Area Off Back Entry For Your After Park Walks! Updates Include New Siding In 2017, New A/C & Furnace In 2016, Newer E-Rated Windows, Kitchen Upgrade Was Done In 2011 With Bamboo Flooring, New Counter Tops And No Slam Slow-Close Cabinets Too! All Appliances Will Stay! Roof is About 10 Years Old. All 4 Bedrooms Are Upstairs And Master Bath Has Been Updated Recently With Nice Floor And Newer Vanity! Partially Finished Basement Is A Extra Reward To Make Into Your Own Great Escape! Built In Storage Provides Organization For All The Holiday Decorations! This Backyard Has A Deck Attached To The Slider Off The Family Room So You Can Sit And Enjoy The Beautiful Views Of Nature! Covered Front Porch Is Your Entry Invitation To Your New Address! Two Car Attached Garage Has Massive Storage With Attic & Shelving Units That Will Stay! This Property Is On A Desirable Street And Has Home Written All Over It! Make Your Appointment Today! Some Furnishings Will Stay! Contact Agent Tom Nevans For All Details! Directions: South Of Square On (RT. 3) To Hartford to Bristol Ln.